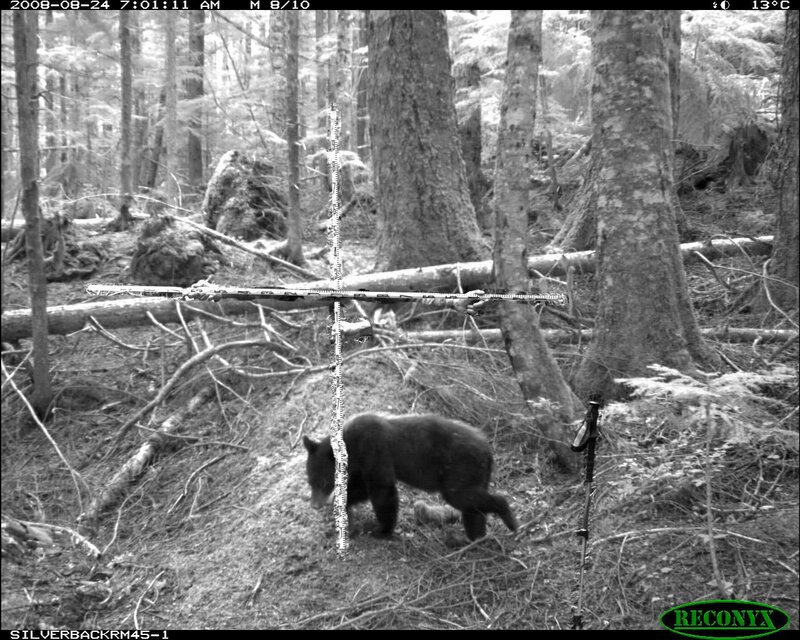 How big is that bear/deer/big hairy mammal/stump in your trail cam pics? It is not difficult to get an approximation. I use metric Pocket Rods to scale animal images. 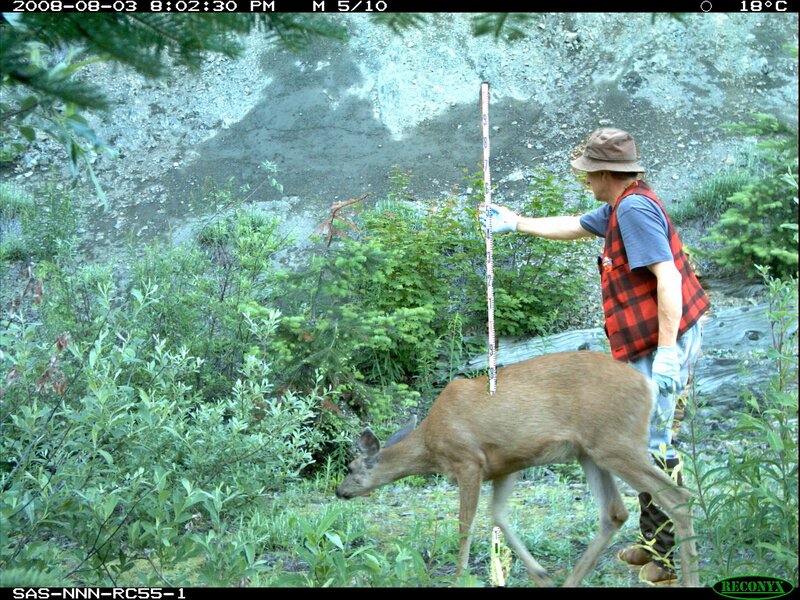 I use metric due to the resolution of trail cameras. It is easy to see centimeters. After I place a trail cam and before I switch out the storage media/batteries, I wander around in front of the camera, stopping in many places. Sturdy camera mounts are important for image alignment. I have home made accessories for my Pocket Rods for distance from camera.. The Pocket Rod is 2 meters in length. The 1 meter mark is in red ink. The horizontal Pocket Rod has the 1 meter mark in front of my whistle & signal mirror. 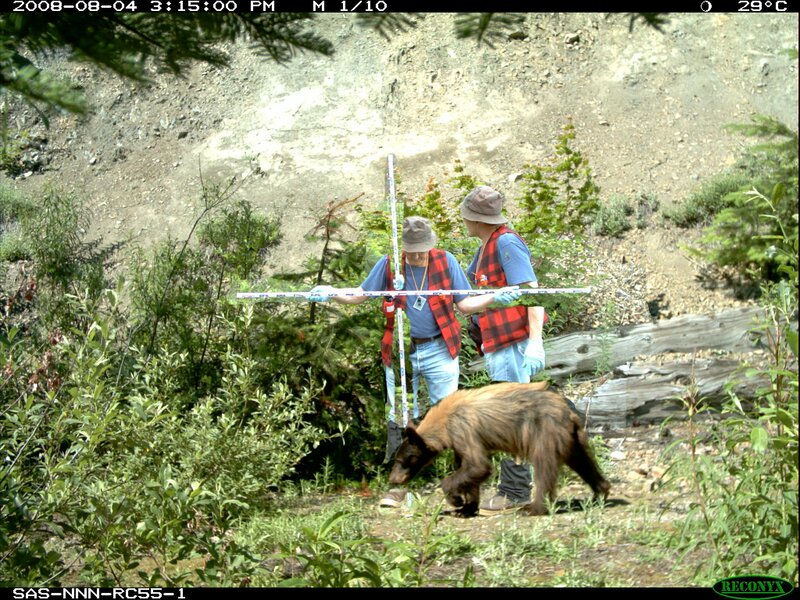 A little image processing and the bear is scaled. In setting this image up, I thought about being the invisible researcher and just adding my gloved hands and Pocket Rods. Here we have Jane Doe. No deers were poked during this exercise. Accessories for measuring. The image below is from my 1st set of distance cards. They were made from 3 X 5 cards. My new sets are plastic. The distance cards are slipped over the 'blade'. The image shows the Pocket Rod at 1/2 meter away from the camera ( the comma is not in view ). A tape measure is stretched out on the ground and I walk out to the distance indicated on the cards. That's so smart, I can't believe I didn't think of it first. Stay tuned, I have more. My new distance scales are larger for moving further away from the camera. The scale routine does take time in the field to set up and does not burn up an SD card. Assembling night time images that were created in IR is ugly, but it still works. Scaling a moving bear in black & white. I went invisible and have my hands in the image. I left my trekking pole in place. The length is adjustable and I record the 'height'.